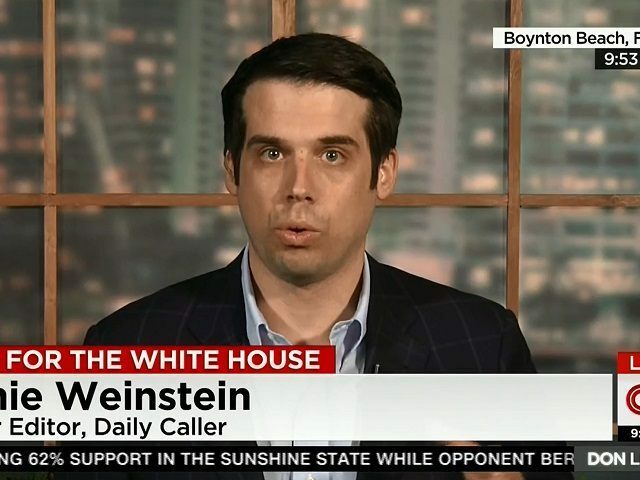 The Daily Caller’s Senior Writer Jamie Weinstein, a member of the “NeverTrump” faction, has proposed a “negotiated Republican surrender” to Hillary Clinton. The suggested deal rests on the assumption that Clinton is “on a glide path to the White House,” and that Republicans would do best to appease her now. The terms: Republican leaders agree to “rescind” endorsements of Trump in exchange for one Supreme Court seat; rudimentary entitlement reform (read: higher taxes); a “Gang of Eight-style immigration bill”; a federal minimum-wage increase; up-or-down votes on future Supreme Court nominees; and a few national security appointments. There is no room for actual voters in this scheme, which Weinstein envisions as a brokered arrangement between politicians. Ideally, the Republican delegation would include a wide range of respected Republicans and conservatives from both the establishment and anti-establishment, but for it to matter to Hillary, it must also definitely include Republican congressional leaders like House Speaker Paul Ryan and Senate Majority Leader Mitch McConnell (and as many other members of Congress as possible) who would actually be in a position of fulfill the commitments of a deal. Weinstein concedes that one of his premises contradicts the other: if Trump is doing so badly, why would Clinton agree to a deal? Weinstein does not explain how Republicans might be expected to oppose Clinton’s other policies once she takes office. Nor does he explain why, having surrendered once, Republicans would not be expected to surrender again, and again, and again. Essentially, Weinstein is proposing that Hillary Clinton control, and ultimately destroy, the Republican Party. But perhaps, if it keeps Donald Trump out of office, a perpetual dictatorship of the radical left is worth considering.